Black conducts for the Lakeland Choir during an intense performance. Lakeland choir concerts are back, and this time with a bit of a shake-up. 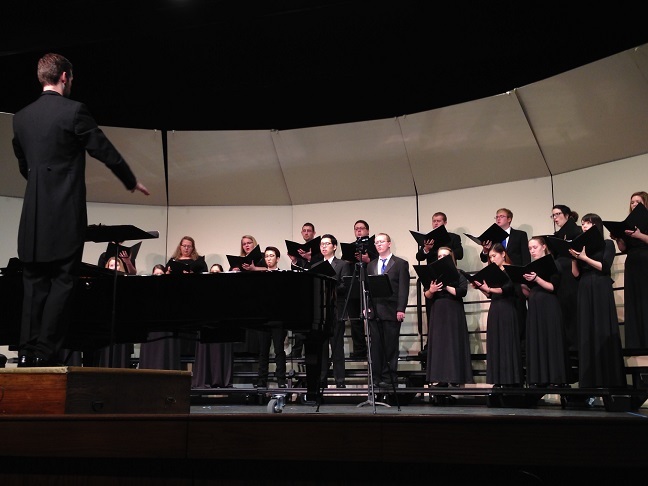 In the Bradley Theater on Sunday, Oct. 11, students and other spectators were treated to a double feature by the Chorale and the Lakeland College Choir. Chorale is open to singers of any level of experience, while the mixed-voice Lakeland College Choir only accepts “the most skilled singers of Lakeland.” Both are conducted by Lakeland’s Director of Choral Activities, Daniel David Black. The Lakeland Choir prepared to take the second act by rolling an organ onto the stage, soon to be manned by Lakeland College alumnus Thomas Pibal in a chilling performance of the Introit from Maurice Durufle’s “Requiem.” Black promised “a very special performance” of the full piece would take place on Saturday, Feb. 27. Pibal stepped over from the organ to the piano for the final two songs. Black introduced David Dickau’s “If Music Be the Food of Love” as a comparison between “the experience of being loved and the experience of being overwhelmed with music;” a fitting description for the audience’s own experience that day. The closing performance of Byron J. Smith’s “Worthy to be Praised” featured solos from soprano Katherine Zielsdorf and baritone Shunya Iida. The presence of two choirs and the Lakeland Choir’s mixed-voice structure ensured a long concert with plenty of diversity in content. Anticipating the applause following the final performance of the day, Black was sure to preface it with a promise for more. The Lakeland Christmas Concert will take place on Friday, Dec. 4, while 2016’s Spring tour will end with a home concert on Sunday, April 17.